Hello people! 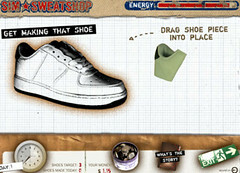 Just came across this sweatshop game that ties in nicely to what we have been looking at in lessons, give it a go and let me know how you got on by leaving a comment. This entry was posted in Global fashion. Bookmark the permalink.